I'm not a huge fan of royalty books, and for the record, I'm less of a fan of fake, made-up royalty books. I "get" why they're popular within romance circles, especially with American readers. Heck, we tell King George III to take a hike and then we spend the next 200+ years obsessed with all things royal. To Americans, especially, royalty is immediate short-hand for "fairy tale." We're a country that made Walt Disney a boatload of cash after all. 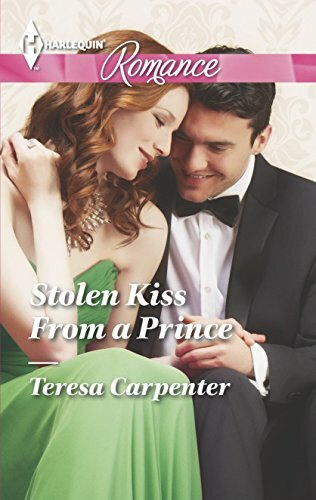 So while Stolen Kiss from a Prince is a book that wouldn't normally land in my wheel-house, I've been meaning to try Teresa Carpenter again. Mostly because she's a local author, and the one previous book I tried was a DNF thanks to my own wacky, irrational reader baggage. My foibles aren't her fault, and I liked the writing well enough to give her another go. Julian is the "spare" Prince to the throne of Kardana. While he was groomed to be a fine, upstanding, proper royal, the threat of him actually taking over the throne is slim. His older brother, Donal, is married and son, Samson "Sammy," is a toddler. Then Donal and his wife decide to take a ski holiday and a winter storm nobody thought would be severe, lead to a downed planed and a missing royal couple. Sammy is in the neighboring kingdom of Pasadonia, and Julian goes to collect him, to bring him back to his family, and runs up against nanny Katrina Vicente. Katrina is a nanny in the royal house of Pasadonia, and is a minor royal herself. However it's not a relationship she plays up - just the opposite. Katrina's goal in life is to blend into the woodwork as much as humanly possible. If she could morph into a potted plant she would. She's been the one caring for Sammy, who has become uncontrollably distraught after his own nanny opened her big fat mouth and tells him about his parents being missing and implying that they're never coming home - which honestly, nobody knows for sure yet. Now in storms Julian, disturbing the child even more after she nearly pulled her own hair out to get the child to settle down and rest. We all know where this is going, right? Julia is all Alpha male, jumping to conclusions and making assumptions. Katrina is the nanny who can soothe the most savage of toddler beasts. Before you can say Cinderella, Katrina is charged with keeping watch over Sammy as the trio flies back to Kardana, Julian oversees his missing brother's duties, and keeps on top of the rescue efforts. This is an old-fashioned romance. Which implies that I'm damning it with faint praise, which isn't my intention. "Traditional" is probably the better word. If you were a romance reader who discovered the genre thanks to that ubiquitous grocery bag full Harlequins at 1) grandma's house 2) at the babysitting job and/or 3) in mom's closet - this is the sort of story you probably would have found there. I could totally see this being a "gateway" book for some romance neophyte teen girl, rummaging around at a library used book sale. It's got all the ingredients to make fairy-tale lovers happy - the heroine who doesn't want to be the center of attention but swoops in to save the day anyway, the handsome Alpha prince with just the right amount of Jerk Tendencies, family tragedy to ramp up the emotional angst, and lest we forget - the precocious tot. Where this story elevates itself from just your normal, run-of-the-mill fairy tale is with the ending. Eventually, like should happen with all good romance heroines, Katrina finds her voice. She learns to stand tall. To a certain extent she does continue to run scared, but she also is unwilling to settle for second best. She loves Julian, but she's not going to settle for just loving him and Sammy. No, she deserves to be loved in return - which means Julian having to wake up and smell the coffee. So while this normally isn't my sort of read, it's a very pleasant way to spend the time. If you're not a huge fan of royalty books, there's probably not a ton here to sway your opinion. But if you love the fairy tale? If you want the handsome prince hero? Look no further.